As you exercise, your muscles are depleted of glycogen, a stored energy reserve made of glucose and carbohydrates. The depletion of glycogen, the resulting build-up of free radicals and micro tears in the muscle tissue, all contribute to post-workout muscle soreness. Vitamins including C, E and potassium can help restore the balance of nutrients lost, reduce free radicals, and reduce pain and inflammation that occur after working out. Vitamin E acts as an antioxidant which reduces the build-up of oxidation or free radical damage caused by exercise and physical activity. In studies done at Tufts University in Massachusetts, vitamin E doses of 200 to 400 I.U. provided a reduction in muscle soreness in younger men who exercised, but did not exercise everyday. Eating foods rich in vitamin E, such as almonds, sunflower seeds and wheat germ, help restore glycogen to the muscles which reduces soreness. According to Dr. Michael Zimmermann at the Human Nutrition Laboratory in Zurich, Switzerland, vitamin C works better in combination with vitamin E, than as a single vitamin to reduce inflammation in the muscles during and after exercise. In this study, 1 g of ascorbic acid, vitamin C, was used along with 400 mg of vitamin E. As the inflammation in and around the muscles is reduced, the muscle soreness decreases. Vitamin C is also responsible for collagen production and repair of damage to tendons and ligaments, which can mimic muscle soreness. The Recommended Daily Allowance of vitamin C is 75 mg per day for women and 90 mg per day for men and can be found in foods, such as green peppers, papaya, tomatoes, strawberries and blueberries. Considered an electrolyte, potassium is also categorized as a vitamin and is essential in the balance of fluids inside and outside of the cells which transport nutrients. Replacing electrolytes, such as potassium, should be done in the hours following physical activity when the loss is highest and can contribute to muscle cramps and soreness. Since deficiencies are rare, there is no established RDA for potassium, but the Average Daily Intake levels of 1600 mg to 2000 mg per day are adequate. Food sources of potassium include bananas, avocados, acorn squash, yogurt, nuts and seeds. As the muscle contracts during movement, the amount of calcium in the muscle is greater than the amount of magnesium -- and as the movement ends, the amount of magnesium in the muscle must be greater than the calcium in order for the muscles to relax. Magnesium can be lost during exercise through urinary excretion and sweat and a deficiency can contribute to muscle cramps and muscle soreness. The Recommended Daily Allowance of magnesium for males over the age of 31 is 420 mg per day and for women over age 31 is 320 mg per day. Halibut, almonds, spinach, cashews and oatmeal are healthy sources of magnesium. When you eat fresh foods rich in vitamins rather than using a vitamin supplement, you also gain the benefit of other nutrients, fiber and antioxidants. 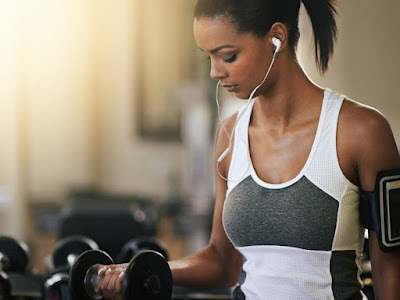 As chronic muscle soreness after working out may be a symptom of a more serious medical condition, seek medical advice if your muscle soreness continues.